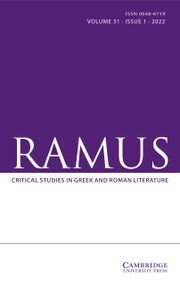 Ramus: Critical Studies in Greek and Roman Literature is a journal of innovative literary criticism aimed at new analysis and interpretation of ancient Greek and Roman literary texts. It is intellectually pluralist, and offers its pages to the full range of contemporary theoretical positions and methodologies from Marxism, feminism, postcolonialism and social anthropology, to narratology, deconstruction and reception studies. It is, however, a journal of criticism, not of theory, and it is primarily concerned with original and significant elucidation of ancient Greek and Roman authors.